There's a lot of talk recently in Alberta about uniting the right, but is there even a right anymore? There was a time when conservatism was synonymous with small accountable government, protection of property rights, frugal government spending, a society organized around Burke's little platoons (family, business, charity, community, the church), fierce advocacy of free market capitalism, minding one's business, and an aversion to taxation. Those days are long past. 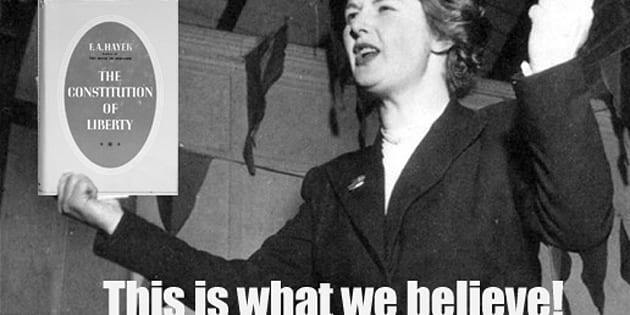 Now the term conservatism is synonymous with a hawkish foreign policy influenced by Trotskyism, Christian fundamentalism, a fixation on muslims, a surveillance state, closed borders, a command and control economy, and dogmatic opposition to social freedoms. Once upon a time you could accuse a conservative of being principled. 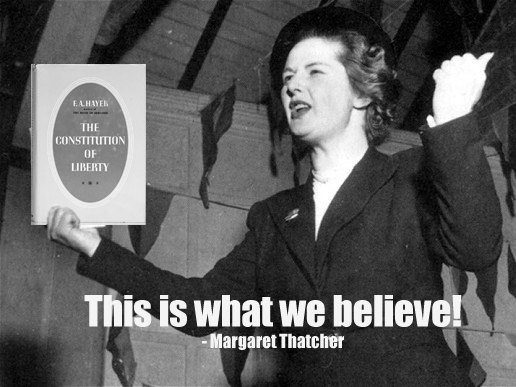 Newly elected party leader Maggie Thatcher said 'that's what we believe" and smacked down a moderate with Hayeks' The Constitution of Liberty in response to his pleas for caution. Now conservatism is nothing more than a constellation of feelings and platitudes shifting with the zeitgeist of a left leaning culture. Conservatism has become an aesthetic in opposition to "the left" rather than an ethos anchored in philosophical bedrock. Conservatives have traded away their soul and now we are all paying the price. How did conservatives get this way? Are they a flock of lost sheep who can't remember what brought them together? Are they well meaning cuckholds who are so afraid they'll lose power that they'll do anything to keep it? Are they just straightforward traitors? What explains Stephen Harper's Keynesian apologetics and auto industry bailouts? What explains Brad Wall recently calling for federal money to employ oil and gas workers? How does Preston Manning explain his advocacy for taxing the primary energy source protecting us from a hostile climate in the name of 'climate action'? On what principle would Mr. Harper oppose a subsidy to Bombardier, or Mr. Wall oppose government green energy projects, or Mr. Manning oppose uniting all the parties under one giant feel-good umbrella? How does a conservative that loves socialized healthcare oppose socialized food production and distribution? How is a social conservative who rallies vociferously to get the state involved in marriage (ie to prohibit gay marriage) going to oppose a state agenda on marriage imposed on their church? How does a conservative who supports invasion of privacy visa vi Bill C-51 and C-13 oppose a surveillance state interested in quashing conservative dissidents? What principle will a cannabis prohibitionist use to oppose banning sugary soft drinks? I can't remember the last time I met a conservative voter who could tell me why socialism is both unethical and not pragmatic. I can't remember the last time I met a conservative voter who could tell me the philosophical basis for property rights, or from whence the state emerges and gets its right to rule, or even basic economic principles. The average conservative, in my estimation, is running off emotional instinct and spoon fed talking points. They've been left blowing in the wind and this is a huge problem. I posit that the fall of conservatism in the West is because key leaders in the movement have sacrificed principle in order to win. In fact the problem is that their definition of winning is entirely misguided. The metric of success shouldn't be whether one wins a popularity contest or not. If you have to be Trotskyist on foreign policy, Marxist on healthcare and supply management, Keynesian in economic and monetary policy in order to get the win, well you haven't won anything worthwhile have you? The metric of success should be a society and government aligned with the enlightenment principles that undergird western civilization. Now these same power mongers are scrambling. They are apoplectic that Notley and Trudeau are leading this country off a precipice. They fail to acknowledge any personal culpability. Notley, Trudeau, this continual slide to the left, is a predictable consequence of sacrificing principle for the 'win'. Notley is meeting a market demand for people who love big government and other people who are just sick of the establishment. Like all successful politicians she is a reflection of culture not a driver of it. We are in trouble not because of particular politicians but because of a culture devoid of an ethical compass, driven by base fears, that views government as a wish-fulfilling committee of virtue rather than a necessary evil to be restricted. The only thing that will turn this around is a shift in culture. To win an election you must reflect and reinforce status quo culture, but to create the kind of government conservatives want requires a cultural shift. Government emerges from culture. Do you want a conservative government or a conservative in charge of a socialist government? My appeal isn't to conservative political puppet masters, they are a lost cause as far as I can tell. They know the difference between right and wrong, and have sacrificed principle for power. I could forgive them if they at least framed their capitulations as necessary compromises, but they would never openly acknowledge sacrificed principles and so whatever leftist policy the priestly class in conservatism put out becomes new conservative dogma instead of regrettable sin. My appeal is to the conservative base. You don't need the right to unite with cucks and traitors. True conservatives should stay principled and focus on shifting culture rather than listening to the seductive whisperings of the power hungry. We would be better off if those willing to capitulate for power united with the left. Instead of 40 years of an entrenched conservative government that maintains power by continually capitulating ground to left-wing ideologues until it is virtually indistinguishable from leftist regime, maybe we'd be better of with 40 years of an entrenched NDP government that continually capitulates its left wing ideology for power until they are virtually indistinguishable from a true conservative regime. I would rather have that than another cuckholded "conservative" party chasing power.